With the incredible success of the Xcalibur sport jet the next logical development was a larger version, after all, bigger models always fly better! This version of the Xcalibur+ is finished in an attractive sport scheme. Developed to suit 80 - 160N Newton turbines, the Xcalibur+ is quick and easy to assemble, making it easy to transport and store. The fuselage is moulded in fibreglass and comes supplied pre-painted with moulded in wheel wells for easy clean-up when used on grass fields. The large top hatch is secured by one bolt for quick and easy access to the turbine and electronics. The wings, booms and tail are built-up from balsa and ply and then covered in iron-on film to match the fuselage. 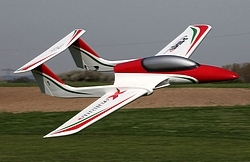 Flight performance of the Xcalibur+ is superb and is capable of a wide range of speeds. 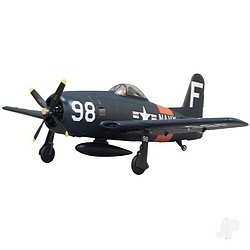 The low wing loading allows for amazingly slow passes to gentle short strip landings making it especially suited to grass fields. The large center flap provides extra lift and increased drag helping to reduce the landing speed and roll on distance. Use a turbine at the larger end of the recommended range and the Xcalibur+ tracks straight and true in high speed passes and is capable of extreme aerobatic manoeuvres.